At St. Albert Summit Family Dental, we take pride in looking after all aspects of your oral health. We love and care about what we do and we especially love to see the positive difference we make in peoples' lives. Our team of professionals has been serving families across generations and along the way we have developed some amazing life long friendships with our patients. We care for and happily serve patients from St. Albert, Morinville, Cardiff, Athabasca, Edmonton, Gibbons, Slave Lake, Yellowknife and many more surrounding areas. Our staff is highly knowledgeable and skilled; we are all Health Care CPR certified and attend continuing dental education courses to keep up-to-date in the fast-changing field of oral health. Welcome to our website! I’d like to take a few moments of your time and introduce myself. I graduated with a dental degree from Boston University Goldman School of Dental Medicine in Boston, Massachusetts. Prior to attending dental school, I attended the University of Alberta and Concordia University. I’ve completed licensure exams for several U.S. states (North East Regional Boards) and Canadian provinces (Alberta, Ontario and British Columbia). I am very passionate about dentistry and enjoy learning new things. My main interests are in orthodontics, (regular braces, clear teeth aligners and lingual/hidden braces), implants, endodontics and restorative dentistry. I am strongly committed to help improve my patient’s oral health and well being while making visits as comfortable and as fun as possible. In today’s world, new research and information in medicine and dentistry is rapidly changing the way we do things. It is important that your oral health care provider stay current with new literature and techniques. I like to keep up with new advances in dentistry and pride myself on offering evidence-based treatment options and clinical procedures. On a personal note, my wife and I enjoy playing golf and tennis with our two young girls. My eldest daughter has recently taken up ice hockey and my youngest daughter is interested in skating. So, if you see my wife and I around the local ice rinks please come say hello! I earned a diploma in Dental hygiene in 2010 and have practiced in Ontario and Alberta. During my dental hygiene career, I also completed a Degree of Health Science. Even though I have completed my formal education, I continually strive to learn and utilize this knowledge to provide individualized and science-based treatment for our patients. Alongside this strong drive to learn is an equally strong desire to build relationships with my patients. We understand that going to the dentist is not always at the top of your list however, having a fun, friendly and knowledgeable family based dental team makes the experience a lot more pleasurable. My focus is on achieving and maintaining optimal oral health with prevention being key. I love helping my patients understand disease and motivating them to make progress tailored to their needs. Patient education is of utmost importance, whether it be about your oral hygiene or any other dental treatment you may need. A thorough explanation of all treatment is necessary to make the best decision for your oral health and most importantly your overall health. Once health has been achieved why not explore aesthetic options such as; orthodontics, whitening, Botox, there are so many fun options to give yourself a beautiful healthy smile! In my spare time, I enjoy keeping active. You can usually catch me at the gym or cross-country skiing when the conditions are just right. I love reading and spending time with those that mean the most to me. I graduated from the Dental Hygiene program at the University of Alberta in 1999 and have been working with Dr. Habib ever since. Getting to work with people of all ages to achieve their optimum oral health is one of the most satisfying aspects of my career. I strongly believe in the importance of spending time with people to help them understand their own dental needs. After all the years I have been practicing I still get excited when we have made a positive impact on someone’s oral health and smile. The healing capacity of the body continues to amaze me! One of my favorite things our office does is strive to inspire people to aim for great healthy teeth and gums which can improve not only their smile but their whole-body health. I am also very happy to be part of such a great office team that cares and treats patients like family. I am a mother of two daughters who I am devoted to at home which keeps me very busy. I feel lucky to be able to enjoy Dental Hygiene part time as well as be a stay at home mom. In my free time, I like to stay active and love to do such things as golf, play tennis, downhill ski and swim. I graduated from dental assisting at NSCC in Nova Scotia and moved to Edmonton in 2014. 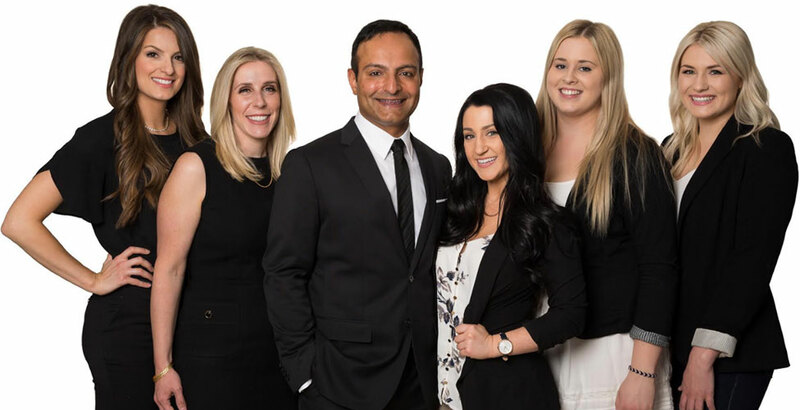 I later obtained my orthodontic module and started working with the amazing team at St. Albert Summit Family Dental. I feel blessed to be here and can’t imagine working with a better group of people! Dr. Habib is the most caring and passionate dentist I have ever met, and I feel very proud to work with someone like him. I enjoy helping patients feel better about their dental care by providing them with all the information they need, listening to their concerns, and helping work with them to give them their best smile. I love that I get to be a part of giving our patients the smile of their dreams with orthodontics. Seeing their smile transformation brings me so much joy! Outside of work I love to read and spend time with my family, friends and my dog Khaos. I love being active whether it’s at the gym, biking, yoga, etc. I love snowboarding and spending time in the mountains in the winter. I graduated from Medical Office Administration in 2013 and have been in the dental field ever since. I have a big interest in dental health, and joined Dr. Habib’s team as his dental administrator in 2015. It has been the best decision I’ve made so far and I am so grateful to be part of a team that feels like family. Every member of the team is so friendly and we all love what we do! We love making an impact in our patient’s lives whether it be with teaching about oral health, braces, Botox, whitening, etc. My role as a dental administrator is to deliver patient treatment plan estimates, booking the schedule, walking the patients out, billing insurance companies and taking payment, and ensuring our patients leave with a smile. From my first visit to Dr. Habib’s office I knew I wanted to be part of their team. My role as a dental sterilization technician is to make sure all instruments are clean, sterilized, and making sure the room is set up and ready for you! I love what I do, everyday is a new learning experience. I enjoy being a part of a professional dental team that provides exceptional dental care. Coming into this job I had little to no knowledge at all in dentistry, but ever since I started I have learned more than I ever imagined in such a short period of time. Dentistry has always been a huge interest of mine and I hope to continue my education soon. The energy this team brings, and the environment I'm surrounded with everyday makes it a second home to me. Away from the office you will find me outdoors, listening to new music, or hanging out with my family and friends. Camping and paddle boarding are my two favourite things to do!